We call them “hardcovers” and people are fretting about whether they will go the way of the dinosaur, the buggy whip, the vinyl record, the 8-track tape players. But there’s life in the format yet. It’s more accurate to refer to these books as “casebound,” and understanding what a casebound book is can help in the decision about how to bind your book. 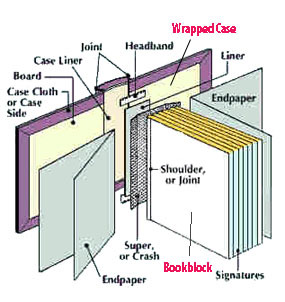 Bookblocks, Case Wraps, What’s It All Mean? Books are produced as two separate parts: the interior, otherwise known as a book block, and the cover. Because they are separate, you can glue a paper cover to some of the bookblocks, and you’ll have softcover books. Making hardcovers is a bit more complicated. Three pieces of stiff board, called binder’s board, are covered with something, like paper, cloth, cloth treated so that it can be printed like paper, leather, or anything else you can cover the boards with. An extra, folded sheet of paper the same size as the book, is attached to the front and back of the bookblock. These are the endpapers. The flyleaves and spine are glued to the case, creating an integrated hardcovered book. In the typical commercial hardcover, the boards are covered with cloth that has been stamped on the spine with the title, author and publisher imprints, and occasionally also on the front of the book. Sometimes the covers are partly cloth and part paper. Without their artistic or commercial dust jackets they would look very bland. The jacket, which sets the mood for the book, or positions it within its genre, or provides hard-hitting sales copy, both complements and promotes the book. This same job is done by the paper covers on softbound books. And it can also be done by casewraps, where the paper used to wrap the case is printed. But casewrap hardcovers can be a deeply integrated expression of the book within. The designer can use the materials at her disposal in printed and stamped papers, with all the finish we’re used to in covers and jackets, but applied to the wrap, the book itself. Manuals and reference books, where a jacket is unecessary and cumbersome. Cookbooks. I learned to cook with a casewrap edition of The Joy of Cooking, and it had a finish you could wipe with a sponge. Wonderful. Textbooks, which need to be durable and economical. Poetry books are lovely as casewraps. For many years a series of books from Peter Pauper Press were issued with pattern-printed paper casewraps, and they’ve become classics. Casewraps are also less expensive than cloth-covered, stamped cases with dust jackets printed separately. Unless you are trying to do a major launch of a book into the retail book distribution channel, it may be hard to justify the expense of a traditional, jacketed hardcover. The upcharge from digital printers like Lightning Source, puts hardcovers well out of reach of normal distribution discounts. For instance, a 200-page 6″ x 9″ softcover costs $3.50 at Lightning Source, already high when you take into account the 55% to 65% discounts you will need to give for distribution. For a casewrap hardcover, add $6.00 each, and for jacketed hardcovers, add $7.55 each. You’ll quickly price yourself out of the market when competing against books from offset printers turning out thousands of copies at once. Use casewraps for the specialty books noted above, since it’s easier to command a higher price for these books. Takeaway: For self-publishers, casewrap hardcovers or softcover books are the bindings of choice. Hi Joel, do you know if librarians prefer casebound or cloth for things like reference? After 9 years, I’m moving my Big Book of Font Combinations from ebook / PDF to PoD (as well as other titles), and haven’t turned up a clear answer on this one yet. Douglas, in my conversations with librarians (and presentations by them), I would say anything goes today–but is not required as it used to be 10 years ago. I would recommend that you talk to some local librarians to confirm this. Hello, I have one quick question. 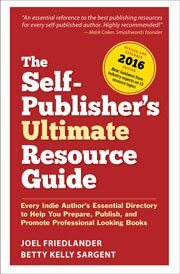 If I self publish online with like lulu.com… does this prevent or hurt me from the possibility of being picked up by an actual publisher in the future? Hi Joel – I so appreciate your article on casebound books. I will be binding about 200-250 copies of a watercolor travel journal I am making. What type of paper would you suggest for covering the bookboard? I will probably use some type of cloth binding for the spine. Would it be possible to have my own “cover” printed at the printers? If so, my question is what type of paper should I choose? Thank you in advance for any help! Colleen, sure you can have the paper you intend to use for covering the boards printed beforehand. Make sure you get plenty of extras. Almost any kind of stock can be used, including exotic papers like rice paper. I would only avoid coated stock, which will make the binding and gluing part of the operation more difficult. And you’ll want to run the cloth on the spine around and cover the hinges and a bit of the front and back boards as well. If you search for images on “quarter binding” you’ll see exactly what I mean. I am a big fan. Your unmatched competency have beautifully guided me through this difficult process of self-publishing. I am about to publish my novel, which is a sophisticated piece of literary fiction. My understanding is that dust jacket is the way to go for my hard copies, right? Thanks Joel! Really appreciate the quick response Your website is awesome! I am new to your website, and am really learning a lot from your articles. I may be asking a question you have answered, but would appreciate your opinion on the quality of books from both CS and LS. I want to self-publish a poetry book that is about 100 pages. I am already set up with ISBNs and am registered with the LOC PRN program. My previous two poetry books were a small print run of 60 books (hard cover) and a larger run of 1,000 paperback (by an offset printer). The latter is still available via Amazon. Now I’d like to try POD. I like everything about the concept but am wondering about the quality of the books. If you already have a thread started on that, could you steer me in that direction? Thanks, and you’re doing a great service for self-publishers/writers. Poetry is such a small market anyway, and it’s wonderful that technology is allowing small voices to be heard. While digital printing can’t yet produce books that are equal to offset printing, they are very close, especially for books that are all type, with no graphics. I’ve seen many books from both CreateSpace and Lightning Source, and they seem about the same to me. I wouldn’t hesitate to go PoD this time around, I think you’ll find it works quite well, and if you still want hardcovers, use Lightning Source. This answers my question perfectly. Thanks for a useful article; I appreciated the illustration of how a book is wrapped and may well switch to casewrap for my most recent book. Thanks again, Joel, for another gem. I may switch from clothbound to casebound if LSI can accomplish what I want. I have always thought of casebound books as looking like “flat” educational textbooks, but if I can get cloth textures, etc. and produce a classy book, I’ll dump my dust jackets and simplify things. Consider that it’s possible to set seller commissions as low as 20% through LSI, even for Amazon sales and the value proposition gets better. Also, big publishers print small-texted, tight-margined paperbacks in volume on offset presses because it mitigates their risk over thousands of books. Self-publishers using POD printing produce a single book at a time. Why not go all out and give your books the best possible packaging? It really doesn’t cost that much more per book compared to the thousands of dollars it costs a big publisher over a volume run.